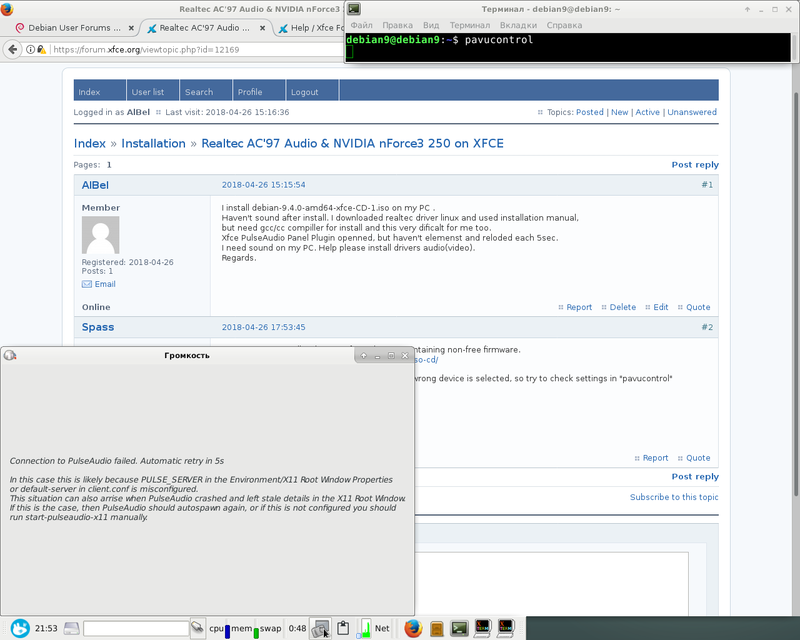 I install debian-9.4.0-amd64-xfce-CD-1.iso on my PC . but need gcc/cc compiller for install and this very dificalt for me too. Xfce PulseAudio Panel Plugin openned, but haven't elemenst and reloded each 5sec. I need sound on my PC. Help please install drivers audio(video). You can try to install Debian 9.4 from this ISO containing non-free firmware. EDIT: And sometime the sound is just muted or wrong device is selected, so try to check settings in "pavucontrol"
thank for link. may be install this non-free image in free time . Have you asked on an appropriate Debian forum? I'm not pointing a finger at Debian, but we don't know if your issue is Xfce-specific, and they may know things we don't.